Eskenazi Health « Davis & Associates, Inc. 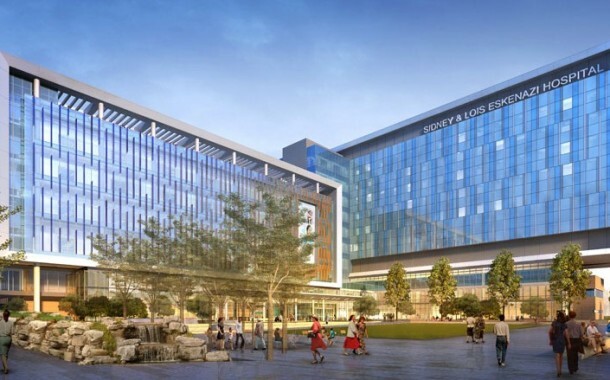 The new Eskenazi Health $754M project replaced the old Wishard Hospital located in Indianapolis, IN. This state-of–the art hospital is a leading health care provider in central Indiana. Davis & Associates was one of the general contractors on this multi-million dollar health care project, completing the general conditions, and the hardscape/landscape bid packages. In addition, Davis & Associates completed the specialties bid package for the Facilities Operations Building located on its’ campus. Eskenazi Health offers a wide range of services at their Campus featuring approximately 1.2 million square feet of facilities, including a 327-bed inpatient hospital, 18 operating rooms and four interventional labs, 12 labor and delivery rooms, a 110-bed treatment room emergency department with a 20-bed clinical decision unit and an ambulatory clinic with more than 200 exam rooms. A faculty and research facility housing offices for Eskenazi Health’s physicians, 99 percent of whom are on the IU School of Medicine Faculty, as well as administrative offices and research areas. The campus includes an appr oximately 2,700-car parking garage, central engineering facilities for utility services and open spaces including a patient garden, an open public space plaza called Eskenazi Health Place and healing gardens.